To increase work productivity and speed up daily computer activities, you require an excellent productivity tool with easily customizable options. Quick Cliq is an excellent productivity tool developed by ‘Apathy Softworks’, which enhances your system speed and efficiency. Quick Cliq offers a free menu-based app launcher and productivity toolkit for Windows. The efficiency will be amplified by creating shortcuts to files, folders, URLs, Windows features, and more while consuming very less system resources that may affect PC’s performance. Quick Cliq is a lightweight portable app launcher which in addition offers a memo keeper, a clipboard enhancer, and desktop configuration tools. Downloading and running the application is a pretty easy. As it is portable, you can carry it on any memory device to run the program from. The interface provides you general settings for customizing menu hot keys and mouse gestures in addition with an optional tutorial. You can disable or change any gesture and hot-key. If you want to add, modify, or delete shortcuts on menus, you can open Quick Cliq Editor tool. The new version 2.0.8 has added few system shortcuts, gestures, menu properties in Quick Cliq Editor, Error Reporting, etc. and fixed feedback sent from a specific IP process which in inactive sometimes. Application Launcher – Fastest way to launch your programs, documents, and commands by creating various types of shortcuts. You can run an unlimited number of commands from just one shortcut. The program offers even email templates and group of special commands to run shortcuts. Clipboard Manager – Quick Cliq gives you a unique feature to enhance the Windows clipboard called “Clips”, which includes 9 additional clipboards to use. You can perform data conversions, case changes, URL retrieval, and standard copy-paste commands. Memos – This is a personal notes keeper to maintain your notes, text, and other commonly used data. Memos are different from the “Clips” feature, even it looks similar. For example, Memo files can encrypt sensitive data, send the memo content to the active window, and carry out other operations. Windows Manager – This feature includes a group of commands you can quickly operate on the active windows such as hiding & changing the transparency of the active window, disabling the close button to prevent accidental closes. 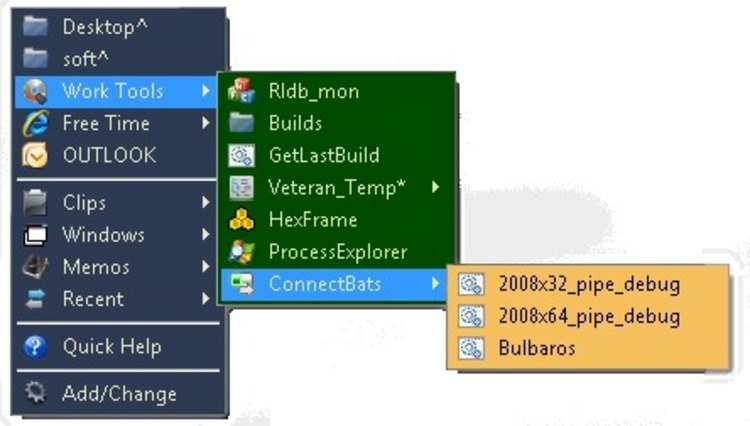 Recent Items – Logs recently used folders, processes, system items, and shortcuts in order to open them quickly. Highly Customizable – You can open any menu with a hotkey or mouse gesture, define custom hotkeys for any shortcut, set unique icons for any shortcut or custom menu, and many more depending on your need. Comes with a single executable file with hassle-free installation. Windows 8, 7, Vista and XP Compatibility.